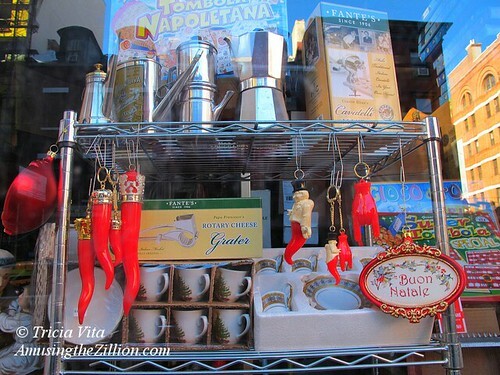 Buon Natale from magical Mulberry Street! 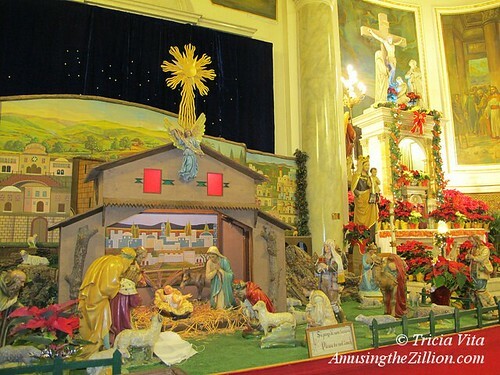 These photos were taken very early on Christmas morning in Little Italy after Mass at the Church of the Most Precious Blood and Shrine of San Gennaro. 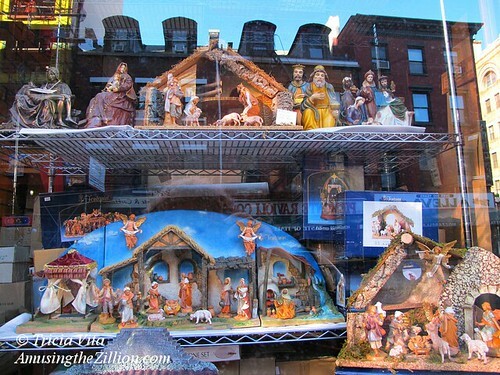 Crèches, Christmas tree ornaments, and an array of amulets to protect against the evil eye were on display in store windows. 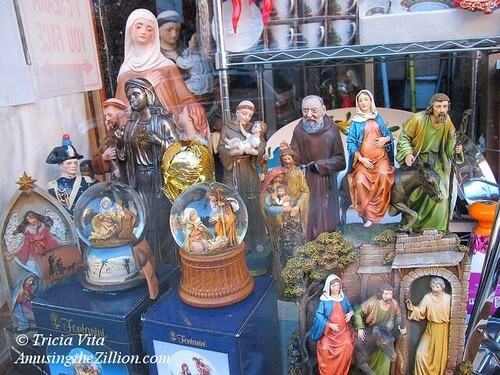 There were also snow globes of the holy family and statues of Napoleon as well as espresso sets and cheese graters, but none could be purchased since the shops were closed on Christmas morn. Inspired by the humility and inclusivity of Pope Francis, ATZ went to Christmas Mass last year for the first time in a very long time. This beautiful church on Mulberry Street was built in 1888 but currently has very few parishioners—there were only about 10 people at the Christmas morning Mass. The last time that we there, for the Feast of San Gennaro on September 19th, we took photos of the crowds, the food and the carnival games on Mulberry Street, as well as the procession featuring the Statue of San Gennaro and the interior of the Church of the Most Precious Blood. It was the day of the saint’s martyrdom in the 4th century and thus the procession and the miracle. We were told that at 9:30am in Naples, where his body is preserved, the blood of San Gennaro liquefied. Fair season is in full swing in the Southeast with the 11-day Coastal Carolina Fair in South Carolina’s Charleston County wrapping up this weekend. 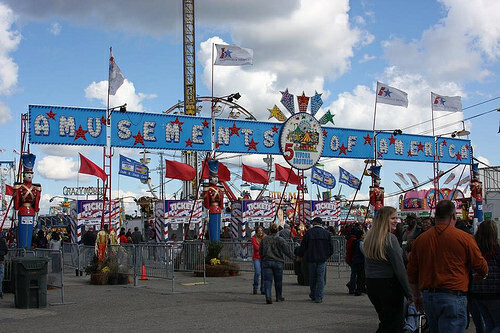 Amusements of America has played the fair for over 50 years and this year’s midway boasts 65 rides including such thrillers as the Crazy Mouse, Banzai, Space Roller and Tornado. 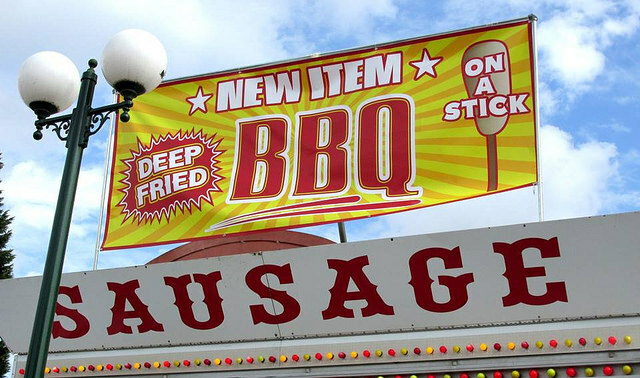 Also on the new foods menu at the fair–Netterfield’s Frosted Flake chicken tenders-on-a-stick and Prowant’s Specialties’ deep-fried Sugar Daddy and pumpkin funnel cake with cream cheese icing. Next week, A of A heads to the November 11-16 Okefenokee Fair in Waycross, Georgia. “For most of us it’s the start of the season,” says a showman in this 1983 video of Scotland’s Kirkcaldy Links Market, Europe’s largest street fair. 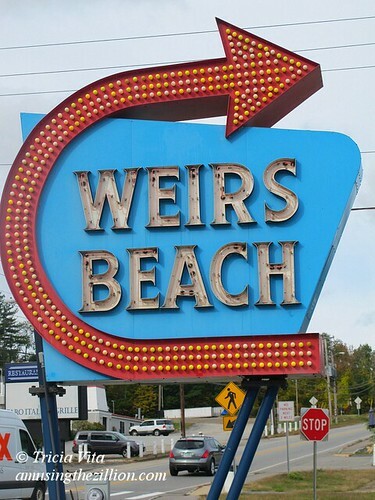 This year’s fair opened on Wednesday and runs through April 21st. 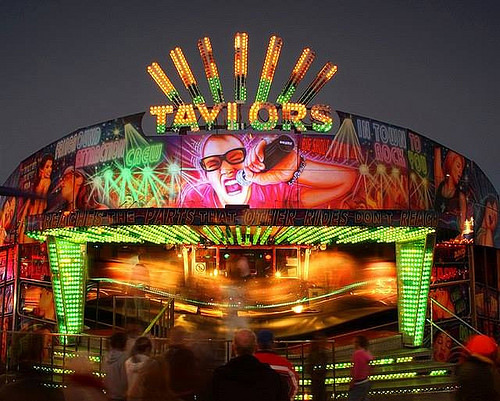 The nearly mile-long midway along the Esplanade in Kirkcaldy, Fife, has over 130 rides as well as sideshows, games and food stalls. A trader’s market has been held annually on the Links of Abbotshall since 1304. 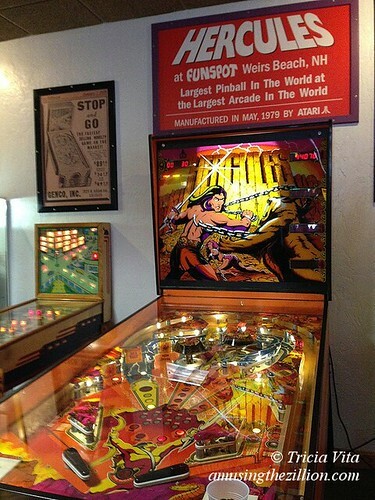 Some of the showmen, estimated to number over 1,000, have played the fair for generations. If a spot opens up, the Showmen’s Guild of Scotland assigns the location. 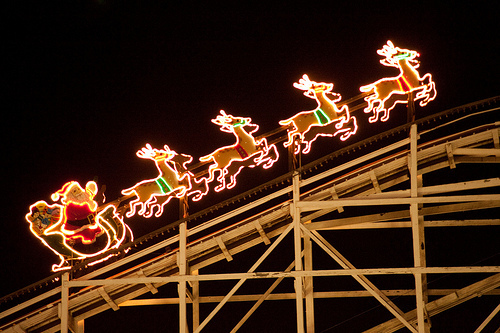 While most amusement parks in northern climes close after Halloween due to the cold weather, a few have extended their season with Christmas celebrations featuring holiday lights, a visit with Santa, and a spin on selected rides for the price of admission. 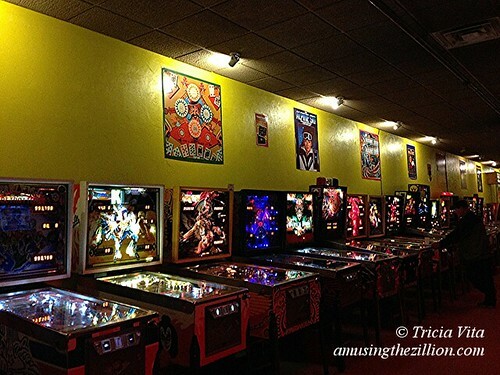 ATZ took a look at four parks that are worth the drive from the New York metro area, as well as Copenhagen’s Tivoli Gardens and Gothenburg’s Liseberg. 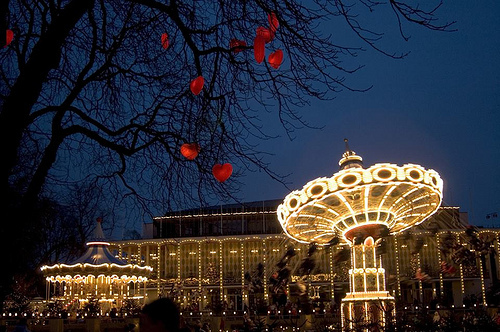 Tivoli Gardens, the 170-year-old amusement park in the heart of Copenhagen, has been open for Christmas for the past 20 years. Thousands of lights adorn the buildings and rides, while glass, mother-of-pearl and heart-shaped lights bedizen the trees. Father Christmas and his elves greet visitors and the Tivoli Boys Guard parades through the Gardens playing Danish and English marches and carols. The park features 50 Christmas stalls and 32 rides including five new rides which are part of a Russian and Scandinavian-themed Christmas. 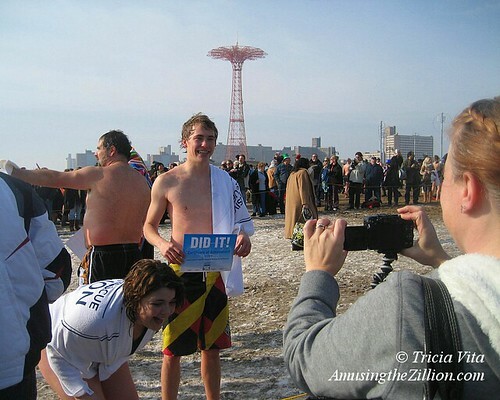 For the first time ever, Tivoli will be open for walk-in guests on New Year’s Eve before the Fireworks are launched. Last year’s successful opening of some of Tivoli’s restaurants on New Year’s Eve sparked the idea of a full scale opening of the rides, games and shops. November 15-December 31. Closed December 24 and 25. 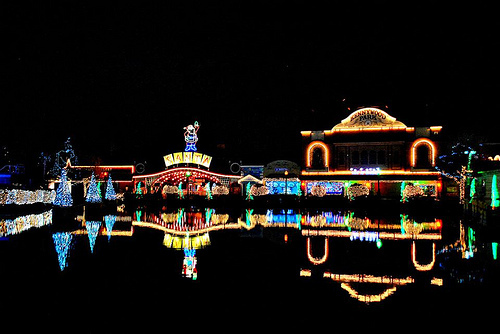 Lake Compounce, North America’s oldest continuously operating amusement park, is bedecked with thousands of bulbs including “12 Days of Christmas” displays to celebrate the park’s 2nd annual Holiday Lights event. A selection of kiddie rides and family rides are open for the occasion. Lake Compounce’s train, which circles the lake, has been recommissioned the North Pole Express. Among the indoor activities are Story Time with Mrs. Claus, cookie decorating and gingerbread house making, carolers, an ice carver, clowns and holiday characters. November 29-December 22, Friday, Saturday and Sunday. Founded in 1905 as a leisure park for Hershey Chocolate Company employees, Hersheypark marks its 30th holiday celebration this year. 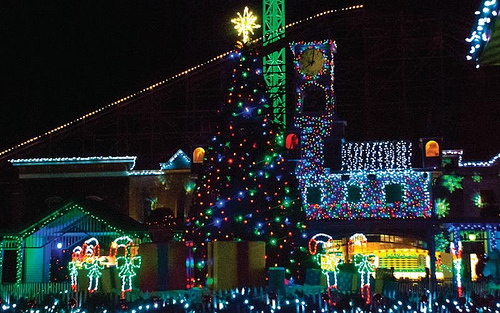 Christmas Candylane features more than 30 of the park’s rides including the Twilight Express, Santa and nine live reindeer, the N.O.E.L light show with 125,000 lights synchronized to Christmas carols, live entertainment, costumed characters, games, shops and food. 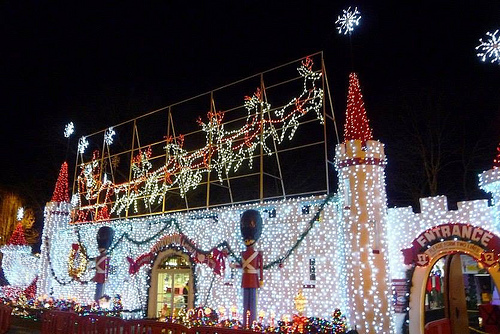 Hershey Sweet Lights is a 2.3-mile drive-thru of 600 themed light displays with a customized radio broadcast. November 15-January 1. Closed December 24 and 25. Fairytale-themed children’s parks were a popular attraction in the 1950s but New Jersey’s Storybook Land, near Atlantic City, is one of the few that has survived and is thriving in the 21st century. 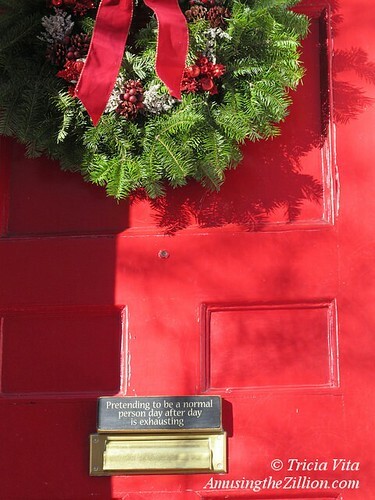 Christmas has been celebrated here for over 25 years and is a tradition for generations of South Jerseyans. Through December 23rd, Santa Claus comes out of the chimney of his house nightly at 5pm, waves his wand and lights the park’s million lights. Bubbles the Coaster, the Tick-Tock Clock Drop and other kiddie rides along with the park’s storybook architecture are also bedizened with lights. November 23-December 30. Closed December 24 and 25. 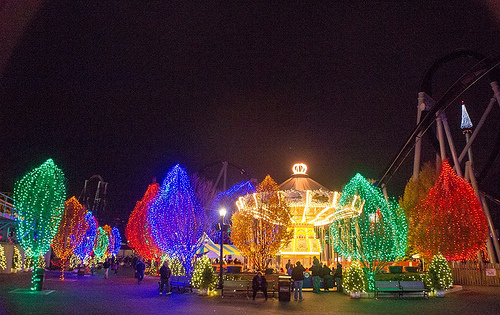 Kennywood’s 3rd Annual Holiday Lights Festival includes two different light shows every half hour in the area surrounding the lagoon, local choirs, magic show, strolling band, dinner with Santa, and readings of “Twas the Night Before Christmas” by Pittsburgh radio and TV personalities. 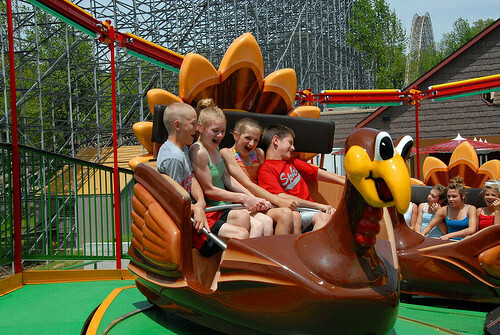 Operating rides include the Paratrooper, Kangaroo, Merry-Go-Round, Turtle, Ghostwood Estate (with a special holiday twist), The Gingerbread Express (Holiday Lights version of the Olde Kennywood Railroad), and up to 9 rides in Kiddieland. Although the park’s roller coasters aren’t open, guests are invited to stop by the Racer to take a unique picture with Santa in a replica coaster car. November 29-December 22. 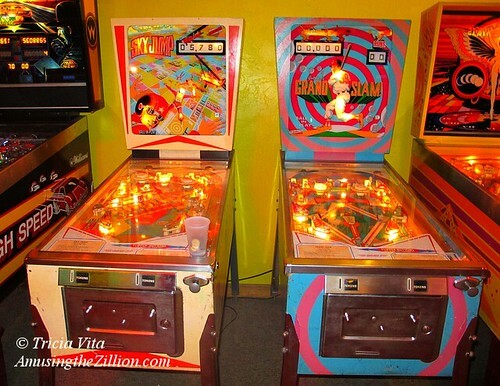 Friday, Saturday and Sunday. Founded in 1923 as a temporary attraction for the 300th anniversary of the city of Gothenburg, Liseberg is Sweden’s most popular amusement park. In November and December, the 260-acre park hosts Scandinavia’s largest Christmas Market, which is illuminated by nearly 5 million lights. 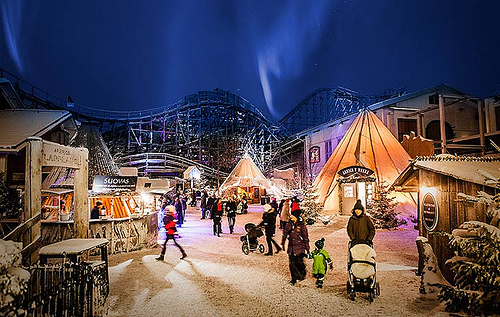 Rustic stalls and shops sell arts and crafts, and traditional food such as marinated herring, roasted reindeer meat from Lapland, marzipan pigs and glögg. Some rides are open including the Liseberg Wheel, carousels and kiddie rides. 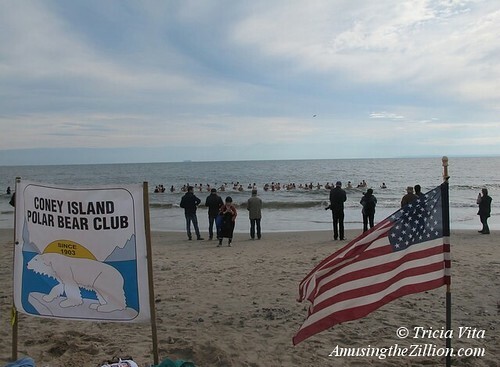 There’s also sleigh rides, an ice skating show, Santa’s House, a midwinter festival at a medieval village, and white rabbits from the North Pole greeting the park’s green rabbit mascot. November 15-December 29. Closed December 24 and 25.